Dignity After Football is the organization whose purpose is to help guide and resolve the problems found in the benefits, disabilities, and pension organization of the NFL. Currently, Congress and the government action agencies are requiring the NFL to comply with resolving the benefits and pensions program that has serious flaws in their process to support disabled and retired players. MEETING IN MPLS UNITES LEADERS OF ALL ADVOCACY GROUPS! Retired NFL Players’ Representatives Unite! I was part of a conference of representatives from various NFL retiree groups and individual retirees yesterday. The participants unanimously agreed to unite in support of the class litigation against the NFL on behalf of retired NFL players. The participants also agreed to present to the League united proposals on needed changes in key areas affecting the welfare of retirees: (a) pension benefits; (b) disability benefits; (c) medical benefits; and (d) medical monitoring. The participants also agreed to coordinate their engagement in a collective and unified campaign to galvanize their respective networks of contacts in order to effectuate the necessary restructuring of the relationship between retired NFL players and the league and the benefits that the league provides to such players. Here is a copy of the press release. The largest collective group of representatives of retired NFL players ever assembled met yesterday in Minneapolis, Minnesota and unanimously supported the class action litigation brought by retired NFL players against the League and its member clubs that is now pending before Judge Susan Nelson in federal court in Minneapolis. 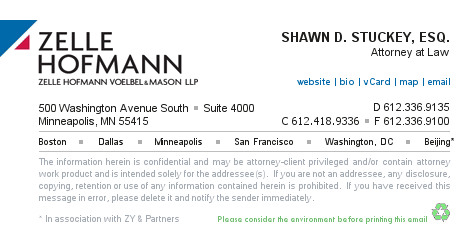 Any questions concerning this press release should be directed to Michael Hausfeld at Hausfeld LLP or Daniel Mason, Mark Feinberg, or Shawn D. Stuckey at Zelle Hofmann Voelbel & Mason. d on May Retired NFL Players’ Representatives Unite! the mission, objectives and cause of the organization is greatly needed and appreciated. (c) 2007 Dignity After Football. All rights reserved.